Appreciate the collections at Vatican Museums and Galleria Borghese. Get some historical perspective at St. Peter's Basilica and Colosseum. Change things up with these side-trips from Rome: Tivoli (Villa d'Este & Villa Adriana). There's lots more to do: contemplate the long history of Palatine Hill, admire the landmark architecture of Pantheon, take a stroll through Trastevere, and don't miss a visit to Roman Forum. To find traveler tips, more things to do, photos, and more tourist information, refer to the Rome travel route planner . Melbourne, Australia to Rome is an approximately 23.5-hour flight. You can also do a combination of train and flight. Due to the time zone difference, you'll gain 9 hours traveling from Melbourne to Rome. Plan for much warmer temperatures traveling from Melbourne in August, with highs in Rome at 38°C and lows at 24°C. On the 8th (Wed), wrap the sightseeing up by early afternoon so you can travel to Prague. Jewish Museum in Prague and Strahov Monastery will appeal to museum buffs. Do some cultural sightseeing at St. Vitus Cathedral and Prague Castle. There's lots more to do: don't miss a visit to Old Town Square, take some stellar pictures from Prague Astronomical Clock, contemplate in the serene atmosphere at Kostel Panny Marie Pred Tynem, and snap pictures at Charles Bridge. For photos, maps, other places to visit, and more tourist information, use the Prague trip planner. You can fly from Rome to Prague in 5 hours. Alternatively, you can drive; or take a train. In August, Prague is little chillier than Rome - with highs of 28°C and lows of 16°C. Cap off your sightseeing on the 14th (Tue) early enough to travel to Berlin. 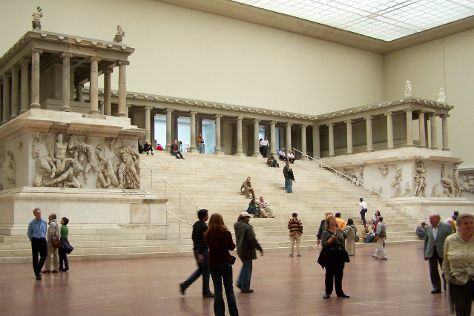 Let the collections at Pergamon Museum and Jewish Museum Berlin capture your imagination. Satisfy your inner culture vulture at Charlottenburg Palace and Topography of Terror. Next up on the itinerary: make a trip to Mauermuseum - Museum Haus am Checkpoint Charlie, get a sense of history and politics at Reichstag Building, examine the collection at Neues Museum, and pause for some photo ops at Brandenburg Gate. To see photos, where to stay, maps, and tourist information, you can read our Berlin trip planner . Traveling by flight from Prague to Berlin takes 3.5 hours. Alternatively, you can drive; or take a train. Finish up your sightseeing early on the 19th (Sun) so you can travel to Edinburgh. Appreciate the collections at Royal Yacht Britannia and Scottish National Gallery. Your inner history buff will appreciate Edinburgh Castle and Palace of Holyroodhouse. There's much more to do: learn more about the world around you at National Museum of Scotland, view the masterpieces at Royal Botanic Garden Edinburgh, contemplate the long history of Real Mary King's Close, and engage your brain at Camera Obscura and World of Illusions. For maps, photos, and more tourist information, read our Edinburgh itinerary website . Getting from Berlin to Edinburgh by flight takes about 5.5 hours. Other options: do a combination of flight and train; or take a train. You'll gain 1 hour traveling from Berlin to Edinburgh due to the time zone difference. In August in Edinburgh, expect temperatures between 21°C during the day and 11°C at night. Cap off your sightseeing on the 24th (Fri) early enough to travel to London. Satisfy your inner culture vulture at Natural History Museum and Westminster Abbey. You'll explore and learn at National Gallery and Tate Modern. And it doesn't end there: explore the world behind art at British Museum, take in the architecture and atmosphere at St. Paul's Cathedral, admire the landmark architecture of Houses of Parliament, and contemplate the long history of Tower of London. To see where to stay, maps, other places to visit, and tourist information, you can read our London trip itinerary maker tool . You can fly from Edinburgh to London in 3.5 hours. Alternatively, you can do a combination of flight, bus, and train; or drive. Prepare for somewhat warmer weather when traveling from Edinburgh in August: high temperatures in London hover around 26°C and lows are around 15°C. Finish your sightseeing early on the 29th (Wed) to allow enough time to travel to Hong Kong. Kick off your visit on the 30th (Thu): enjoy breathtaking views from Victoria Peak (The Peak), then kick back and relax at St. Stephen's Beach, and then take an in-depth tour of Hong Kong Museum of History. For photos, maps, ratings, and more tourist information, you can read our Hong Kong trip itinerary planner . Traveling by flight from London to Hong Kong takes 15.5 hours. Alternatively, you can do a combination of flight and bus; or do a combination of train and flight. Traveling from London to Hong Kong, you'll lose 8 hours due to the time zone difference. Traveling from London in August, you will find days in Hong Kong are a bit warmer (38°C), and nights are much hotter (32°C). Wrap up your sightseeing on the 30th (Thu) early enough to travel back home.